The initialization of iterative clustering algorithms is a difficult yet important problem in the practice of data mining. In this chapter, we discuss two new approaches for building such initial partitions. The first approach applies a procedure for selecting appropriate samples in the spirit of the Cross-Entropy (CE) method, and the second is based on a sequential summarizing schema. In the first approach, we use a sequential sample clustering procedure instead of the simulation step of the CE method. 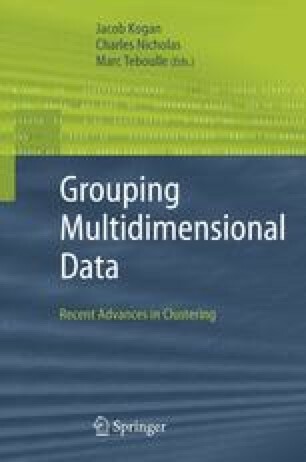 In this context, we state several facts related to the Projection Pursuit methodology for exploring the structure of a high-dimensional data set. In addition we review several external and internal approaches for cluster validity testing. Experimental results for cluster initializations obtained via the CE method and the first of the presented methods are reported for a real data set.